Is legalisation the only way to prevent children from accessing cannabis? New data from the most recent report on cannabis use amongst teenagers may have just debunked the argument that legalising cannabis will lead to more teenagers using the drug. According to a new report by the federal Substance Abuse and Mental Health Services Administration (SAMHSA), use of cannabis by US teenagers fell in 2016 to its lowest since 1994. The study found that the number of teenagers (12-17 year-olds) who had used cannabis in the “past-month” has gradually been decreasing since 2002. Now at 6.5%, down from 8.2% in 2002, the rate of teen use is down to its lowest level since 1994. The report also discovered that consumption of cannabis by teenagers has been fallen every year post-2014, when adult recreational use of cannabis was first legalised by Colorado and Washington. Vehement opponents of the legalisation of cannabis often use the fear of increased use in teenagers to justify keeping the medicinal plant criminalized, arguing that legalising cannabis sends a “wrong message” to teenagers, and that cannabis can be damaging to an adolescent mind. However, there has been a significant number of studies to challenge this argument. 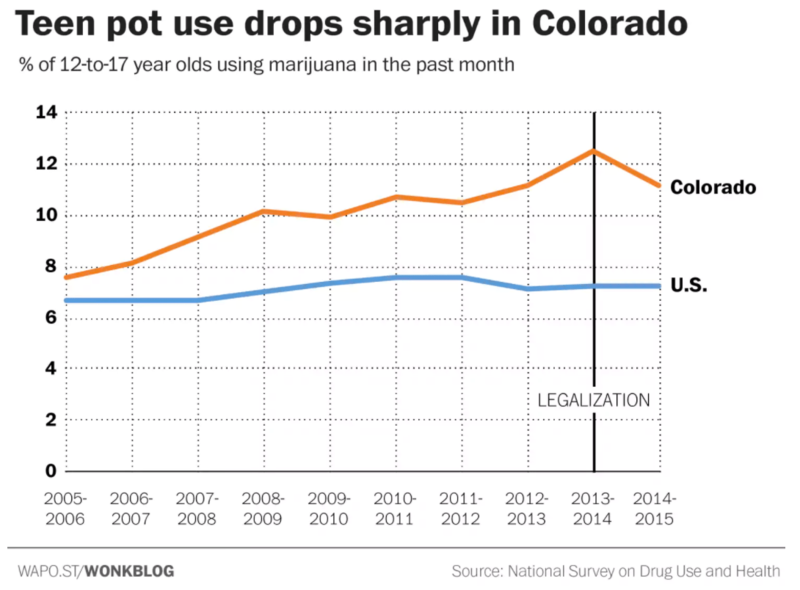 A previous federal survey data showed that teen cannabis use fell dramatically in Colorado in between 2014 and 2015 following legalisation. Recreational cannabis use among adults, however, have significantly risen since legalisation, with the quickest growing consumption group being middle-aged and older adults. In 2016, 20.8% Americans between 18-25 used cannabis at least once a month: the highest since 1985. This figure was only 14.5% for those aged 26-34. What these surveys provide is a clear argument for legalisation of cannabis, both medicinally and recreationally. The facade of the “what about the children” argument has given way to hard facts: legalising cannabis lowers, not raises, use among teenagers.